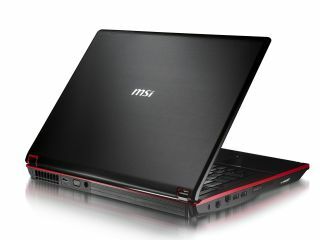 Next month MSI is launching a pair of gaming notebooks, the GX640 and GX740, both just 3.2kg and 2.8cm thick. At the heart of the notebooks are Intel Core i5 dual-core processors and ATi Mobility Radeon 3D discrete graphics cards that offer full DirectX11 support. The company promises exceptional 3D graphics for 3D games. There's also a digital/analogue 7.1 channel audio output and five onboard speakers - two hi-fi 3D speakers above the keyboard, two more along the front and a woofer in the laptop's base. The GX series are the first gaming notebooks to be fitted with GDDR5 (Graphics Double Data Rate, version 5) memory. For those thinking beyond games, the notebooks employ MSI's Cinema Pro technology that includes high-definition movie mode, and five power management levels to save on energy. Users can flip between Game, Movie, Presentation, Word Processing, and Turbo Battery. The notebooks start at £999. But that does include a gaming bag and mouse. It's been a busy week for MSI. the company also recently introduced the Wind Top AE2220 Hi-Fi all-in-one PC. The emphasis of this desktop, unsurprisingly, is sound, with noise-cancelling technology and a pair of full-range 5W hi-fi speakers as part of its audio arsenal. It also offers a 21.5 inch Full HD (1920x1080) 16:9 multi-touch display, Blu-ray, and both VGA and HDMI inputs, allowing gaming consoles to be hooked up to it. You can pick one up for £799.99.